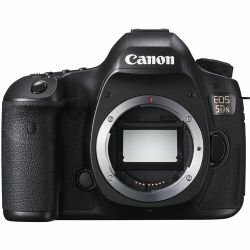 The EOS 5DS DSLR Camera (Body Only) from Canon is the long-awaited follow-up to the vaunted 5D Mark III and brings with it new technology and a number of significant upgrades, placing it in very lofty territory for a DSLR. Featuring a full-frame 50.6MP CMOS sensor, the camera captures ultra-high resolution images suitable for large-scale printing and extensive, creative cropping. The Dual DIGIC 6 Image Processors provide the wherewithal to handle this abundance of information, enabling fast performance speeds and top-of-the-line image quality. The 5DS also features advanced video capability including HD 1080p capture at 30 fps and a Time Lapse movie function which takes still photos at set intervals and combines them into a full HD movie. For stable eye-level composition the 5DS features the Intelligent Viewfinder II with 100% coverage. In addition to its clear view, a superimposed, transparent LCD is incorporated which displays setting information and offers a customizable view of focus points and grid lines. The 3.2" ClearView II LCD monitor provides playback and live view composition with 1,040k-dot resolution and a 170º viewing angle. High-transparency materials and multi-coating resist reflections for bright viewing, especially important when shooting video. For still photography, the EOS 5DS camera features the flexibility of a cropping feature that extends the shooting effect 1.3x and 1.6x. With 50.6MP capture, cropped shots are possible with resolution to spare. Images recorded at 1.3x (APS-H) are approximately 30.5MP (6768 x 4512) Large/Fine JPEG, while images recorded at 1.6x (APS-C) are approximately 19.6MP (5424 x 3616) Large/Fine JPEG. Particularly useful in extending the range of telephoto lenses, the crop function also improves the subject tracking capability with almost the entire frame covered with AF points. Image cropping can be displayed in the viewfinder either masked or overlaid with an outline showing the cropped area, and in Live View shooting the image is cropped by the effect chosen. 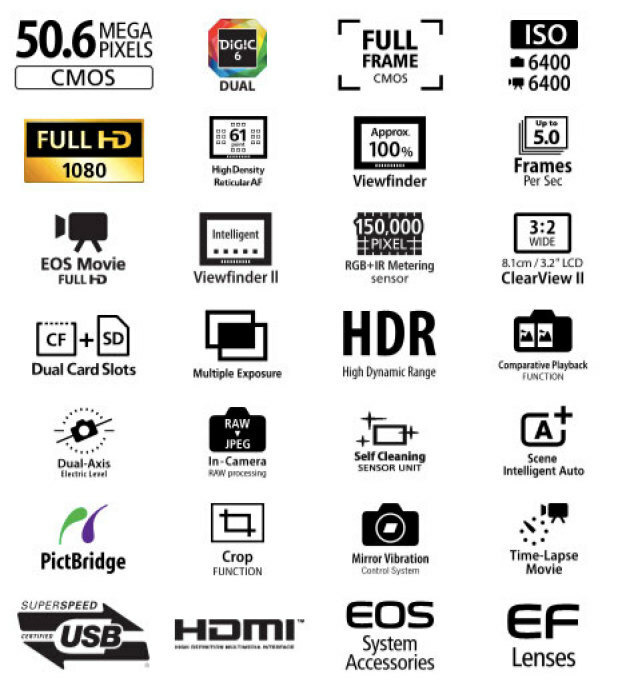 Aspect ratios can also be defined, with the EOS 5DS shooting in 1:1, 4:3, and 16:9 ratios, in addition to the default 3:2.